As I mentioned recently (HERE) my parents were in town visiting from The Fort, so we wanted to make the most of their trip and make it fun. So we decided to spend the next day in Greenville. I had heard wonderful things about brunch at The Green Room, and it didn't disappoint. Like, seriously, probably the best brunch ever. Puff got raspberry cream cheese stuffed French toast, my dad got eggs benedict, and I had some fabulous French toast made on brioche. Bimmer got to try bacon for the first time. Seeing as she swung it around, giggled, and then rubbed it all over her face, I'd say she likes it. I would insert a photo here, but I've been too damn busy to get them off my phone! From there, it was a quick walk over to The Children's Museum of the Upstate. I had been debating for awhile the best age to try it out, and we figured it was time. (We are anxious to try the one in Columbia next!) Needless to say, Bimmer loved it. And of course Puff had to take her to the car related stuff first! 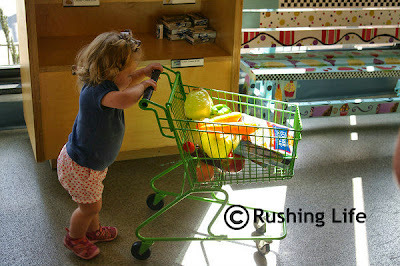 The little grocery store was a definite hit. I'm pretty sure she could have stayed there all day long. She kept taking Papaw fruits and veggies. She brought me poptarts. I think she's on to something. 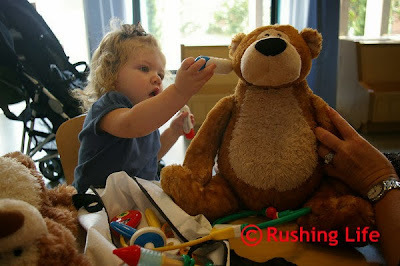 The Teddy Bear Clinic area definitely has me wanting to get her a doctor's kit for Christmas! She kept taking her own temperature in her ear too. So sweet! 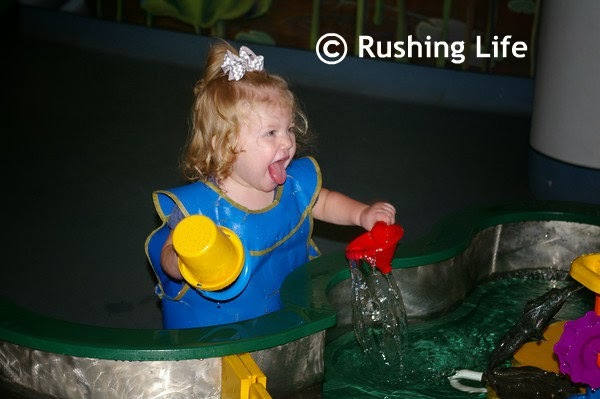 We saved the water table for the end, which was a wise idea. I knew she would absolutely love it, and that's a vast understatement. She splashed so hard and dumped buckets of water all down the front of her. My dad had to buy her a new shirt! Yup - no mistaking it.... Bimmer is a water baby! Anyone else know of any good children's museums? From what my parents said, it was way better than the one back in The Fort. (Which surprises me, since Greenville is such a smaller city!) Anyhoo... it will be interesting for me to watch over the years what stuff at museum interests her versus what does now. I think she was just excited to have stuff scaled more to her size, and to be able to run and play and not get told "No!" We love the Cincinnati Children's Museum! It's a great place to kill a few hours on a rainy fall or snowy winter day. 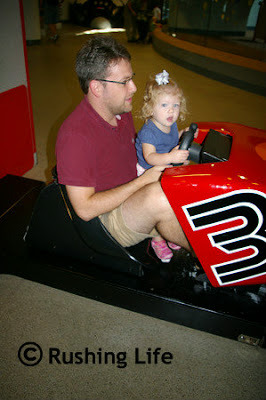 We are hoping to hit the Indianapolis Children's Museum this winter for Jonah's birthday. It's supposed to be one of the best in the country so we'll see! Glad you had a great visit with your parents!